If you ask us is it crucial to have a Snapchat profile for your salon, we would say “Yes!” People are attracted to Snapchat because posts cannot be photoshopped or edited before uploading, and disappear after 24 hours. You can only add colorful filters to your videos and images and put creative stickers on them. When you start using Snapchat and build a set of subscribers or target audience, they will expect you to be real. With Snapchat, you can solve this purpose by providing real, first-hand updates. Imagine you have about 200 subscribers, or even more, and you wish to send an offer or make an announcement through a snap to each one of them. The task will not only be hectic but also a time-consuming one as you will have to select each person’s name manually and then hit ‘Send.’ The time-saving and simpler alternative is to create Snapchat groups and send snaps to multiple people at once. How does this work? It is somewhat similar to WhatsApp groups. Tap the ‘New Chat’ icon on the upper right corner. Select the names of the people you want to add. Remember that you can only add people you follow and who follow you back. Select the blue chat button on the right side to the bottom of the screen, and you will be brought to a chat page. You can change the group name by clicking on the top of the chat page. The group name will be visible to all the group members, just like any other group chat feature on other platforms. Pressing and holding on the group name from your chat screen and clicking the wheel (or Setting) icon will show a menu. This menu allows you to edit group name, mute notifications, add more members to the group or leave the group. You can also do these things by clicking the menu icon on the upper left corner when you’re within the chat window. When you opt to exit a group, all the snaps and chats you sent will be cleared from the group, even if other members of the group have saved your messages. This feature of Snapchat can help you create distinct groups based on your target audience and save you from confusion. For instance, if you cater to men, women, and children, you can have separate groups for men, women, and parents of children or young adults. This way, you can broadcast the right kind of announcements, offers, discounts, information, etc. to your target audience. Managing a couple of groups is better than managing hundreds of chats. 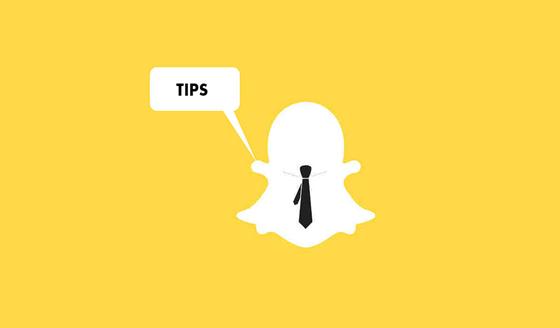 One of the many interesting Snapchat tips for salons is to promote your new products and services using Snapchat. If you have recently introduced a new line of beauty, skincare, or hair care products in your salon, you can show them off to your Snapchatters. One of the best ways to do this is to pick up each product and talk about it. For instance, if you have introduced a new service in your salon, say a new gel manicure or fruit facial service, you can show it’s demo to your subscribers. Shoot a series of start-to-end service so that people can see how the entire process looks like. You can also show the before-and-after snaps so that people can see the effect of your new service in real-time. Get past the 10-second limit with a sequence of images and videos and showcase your salon’s new offerings. You must have seen hair coloring and hair styling videos by world-famous hair specialist Mounir. You too can show off your hair or skin related services through this social media platform. 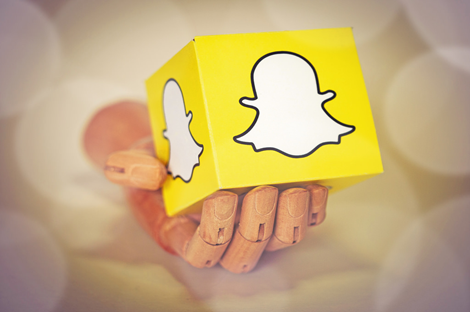 In short, use Snapchat as a guide for customers and subscribers. It’s a smart way to use Snapchat and introduce new products and services and engage with existing and potential customers. Salons and spas introduce several offers and discounts on packages quite often. If your salon is also one of them, Snapchat can be a great platform to promote your offers. The immediacy of Snapchat compels people to take action before your Snapchat story expires in 24 hours. This way, you can expect a quick response from your followers and other Snapchatters right from the moment you post your offers and discounts. 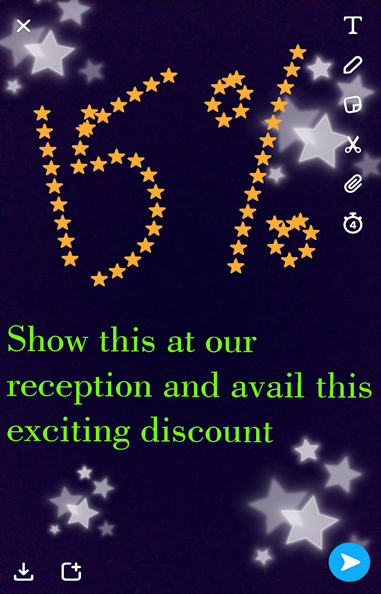 One of the effective Snapchat tips for salons is to offer a call-to-action like “15 percent off today only!” or “Screenshot this snap and present it at the register for $5 off.” Snap stories like these can make people feel that they are getting offers and discounts that others may not be getting. You can take a picture of a current physical coupon you may have, or create a coupon specifically for your Snapchat followers. The coupon should be sent to your Snapchat story so all of your followers can avail the offer. Don’t forget to upload this story by selecting ‘Our Story’ and ‘Geo Story’s features of Snapchat. By uploading your offers under these sections, you can increase the reach of your snaps and target a broader set of local audience. Another way to advertise your offers and discounts is by having a video or post as your Snapchat story explaining everything about the discount and then asking them to swipe up to get the discount coupon. As soon as your viewers swipe up on your story, they will be directed to a link with the landing page of your discount coupon. Another impeccable Snapchat tip for salons is to use the social media platform to promote your events using its basic features. Suppose you are organizing a beauty event in collaboration with one of the top beauty and skincare brand, and you want maximum participation from people. You can share your event’s teaser or poster on Snapchat and also send it to people in their personal chat. You can even shoot a group video wherein you and your entire staff can invite people to attend your event. Use your Snapchat story to post videos explaining the importance of an upcoming event, as well as the date, time, and location. You can also direct your followers to your other platforms such as Facebook or Twitter, for more information or registration links. Just like the ‘Swipe Up’ option used for discounts and offers, you can ask your viewers to swipe up and register for the event. It all depends on where you want your viewers to land, and accordingly, you can put the URL for the landing page. If you have a celebrity endorsing your event, you can request them to shoot a video and send it to you. This video can also be put up on Snapchat to attract the celebrity’s fan. A selfie video by a celebrity will have an enormous impact on your viewers, and they may be encouraged to visit your event. It goes without saying that you should also put live updates of the event on Snapchat. Your viewers who couldn’t make it will love getting a peek into the event, while those who are in attendance will likely be happy to make an appearance in your Snapchat story. Lastly, don’t forget to put the after-event updates on your Snapchat story. Ever seen people updating their snaps with filters of specific cities or places on Snapchat? These filters are known as Geofilters. These Snapchat geofilters, the location-based graphics that you can place over your images and video are a fun way to spice up your snaps and let your subscribers know exactly where you’re snapping from. If you feel that these colorful and interesting filters are readymade for every city, country, and even small places such as malls and restaurants, you are highly mistaken. Every Snapchatters has the freedom to make creative geofilters for various locations. And the best part about geofilters is that they are easy and free to create and simple to use for Snapchatters too. Individuals and business owners have been creating some cool geofilters even for their events. The biggest example of this is a music concert. Numerous geofilters are made for music concerts by countless people. On-demand geofilters for events and specific places is a cost-effective way to promote that event or location. So, why not utilize this opportunity for your salon as well? Create a geofilter for your event or your salon itself. This way, whenever you organize an event, the attendees can use this filter in their snaps and in a way to promote your event, as well as your salon’s name. Similarly, a geofilter of your salon will let your clients snap right from your salon and let people know where they are exactly. Geofilters will soon become a key to search your salon on Snapchat, just the way a hashtag can help you to be found on Instagram. If you have other names that you personally follow on other social media channels, add them to this list and in your Snapchat’s list as well. Colorful filters, face-swapping effects, messaging, and other playful functions have made this social media channel popular among people of all ages. 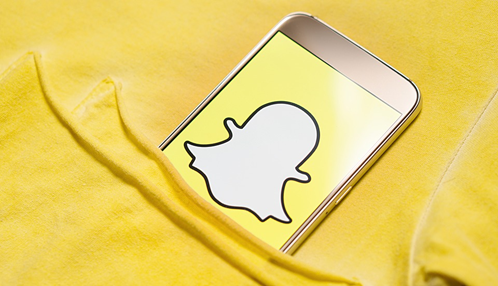 Regardless of the type of your target audience, if you aren’t using Snapchat yet, you are missing out on several opportunities. Start using Snapchat today. If you need any assistance throughout the process, you can talk to our social media experts for professional assistance.